Last month, living historians traveled from as far away as Colorado to help transform Fort McKavett State Historic Site into a military outpost in 1853. 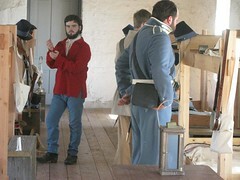 Using the Inspector General’s report on the 8th Military District in 1853, these living historians were able to accurately represent the soldiers of Company H of the 8th Infantry as they appeared at the fort that year. 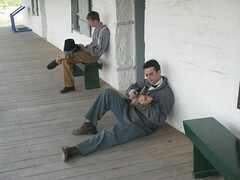 During the course of the program, the living historians carried out everyday tasks of the soldiers—drilling on the parade grounds, performing fatigue details (hauling water and splitting wood for the commissary), policing the grounds (picking up trash and cleaning the barracks and parade grounds), and keeping themselves entertained on the frontier. Several of the participants were musicians who served as the drum and fife corps for the event, and provided period music at night and between fatigue details. The sutler’s store allowed site visitors to see some of the items that would have been on hand in 1853, including popular song broadsides, blank books, dime novels, stationery, clay pipes, chocolates, tin ware, and sewing supplies. The post sutler also provided supplementary foodstuffs for the soldiers (including bread, cheese, and eggs), as well as the catalyst that landed many soldiers in the post guardhouse due to drunkenness. During the event, the commissary cooked the rations for the soldiers and provided extra fatigue details for the officer to dole out. The cook and his assistant provided coffee for the garrison throughout the day. That night, participants were treated to a nice short shower and lightning show as storms blew in from the north and surrounded the site. 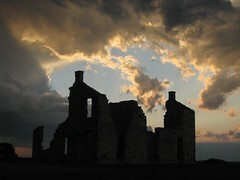 Fort McKavett State Historic Site is located west of Menard on FM 864 in the Texas Forts Trail Region. A rich fabric of our heritage.